This full day shore tour visits the most popular sites in Montenegro including the old town of Kotor, the charming village of Perast, the island of Our Lady of the Rocks and resort village of Budva. You travel along the Mediterranean coast in a private vehicle and reach the mountain village of Cetinje, above the Kotor bay offering stunning views. You will be picked up at the pier in a private vehicle for transportation to Perast. From here, take a water taxi to see Our Lady of the Rocks church and museum. See the islet created by rocks and sunken boats on the beautiful Bay of Kotor before heading back to Perast for a walk. Next, have a panoramic drive to Budva, the most beautiful part of the Montenegrin coast. On your way there, you will have a photo break above one of the most popular beaches in this part of Europe, Jaz beach. The beach was the venue of the concert of the Roling Stones and Madonna. After that, visit the old town Budva, and learn about its rich history. 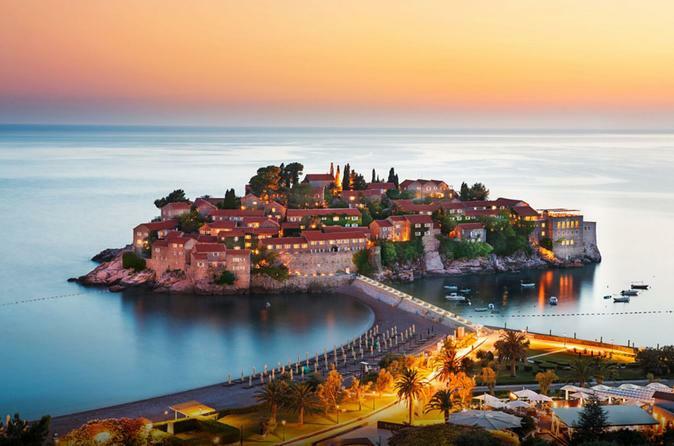 Have a panoramic drive to the island of Sveti Stefan, which is the most famous island on the Adriatic. From here you head to the hill to the city of Cetinje, the Old capital of Montenegro. After a walking tour of Cetinje, you continue the panoramic drive to the mountain village of Njeguša. Next, you return to Kotor through a scenic road with breathetaking views of the bay and many picture stops along the way. Visit the old town of Kotor and its medieval buildings and beautiful streets, squares and palaces, like the 12th century cathedral of St Tryphon.